Ride in a helicopter: DONE! What an amazing trip!! 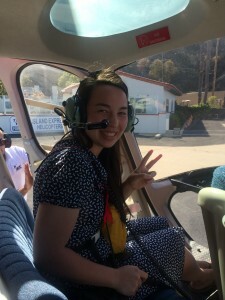 Off the back of my Mommy&me trip, we opted to take a helicopter home from Catalina Island. Just a short 15-minute helicopter ride home, I thought this would be a nice and scenic way to ease myself in (in case I discovered I am terrified or something!). Neither my mom, husband or I had ever been flying in a helicopter so such a great adventure to go on together! We hung out at the Island Express launchpad in Catalina for a little while before our trip watching the helicopters take off and land. The machines looks so impressive touching down onto the helipad, making a great and steady show. So I was surprised at just how still and smoothly the actual ride was. I was lucky enough to sit in the passenger seat up front beside the pilot. Amazing views on all sides! We had been keeping our eyes peeled for whales and dolphins as we had seen some from shore earlier in the trip. We had on cool walkie-talkie headphones and a nice relaxing classical music soundtrack played throughout the flight which felt quite complimentary to the surroundings. It kind of felt like floating. As we neared the harbor in Long Beach, the pilot tipped the helicopter and we circled over a fishing boat below to get a better look. I think that’s probably one of the main things that’s different from (the sensation of) flying in a plane – it just feels so low to the ground and close to everything. There were windows on all sides, even at my feet, so I could really get a clear view all over. Very much like a bird. Very freeing. I really enjoyed it! Such a great alternative to the ferry we took over to the island: faster and smoother and it’s not often I get such an amazing bird’s eye view. What an experience!